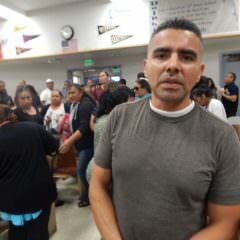 Parent Omar Calvillo at Monday’s meeting at 20th Street Elementary School. Parents may be on the verge of settling a two-year “parent trigger” battle at 20th Street Elementary School without a lawsuit, which both sides hoped to avoid. Nearly 200 parents, students and teachers attended a Monday evening meeting at the school and heard about a unique alternative in which 20th Street would win greater autonomy but be neither an independent charter nor remain solely a traditional district school. The meeting became heated at times, with an equal amount of debate in English and Spanish. Joan Sullivan, CEO of the Partnership for Los Angeles Schools, which was brought into the situation at parent organizers’ request, told the gathering Monday that the Partnership was willing to work with the school and the district to solve the issues that parents have with the teaching and student scores at the K-5th grade campus that serves nearly 600 students in South-Central LA. Coordinator Ana Garcia, right, with other 20th Street teachers and staff. The parents who initiated the parent trigger said they heard for the first time Monday some promising compromises by the school district. 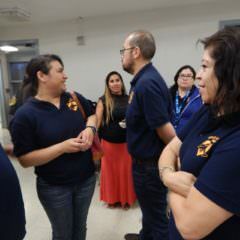 Local District Central Superintendent Roberto Martinez attended and dispelled some of the concerns that the parents had about a deal with Partnership. In March, the district rejected the parent trigger saying the school didn’t qualify because it wasn’t failing, but by that rationale no school in the state would qualify because the state API test scores had been suspended. The district did acknowledge that the parents had gathered enough signatures to trigger a take-over. The most recent 20th Street school report card showed only slight improvements, with 37 percent of 5th-graders passing the California Standards Test compared to a district average of 47 percent. On the new CORE accountability system, the school scored a 46 out of 100. The district average was 60. Omar Calvillo — one of the parents who filed the parent trigger which allows parents to take over a failing school and possibly create a charter school — said he was relieved that the district would allow a standard Memorandum of Understanding (MOU) rather than a more restrictive one that was previously presented to them when they met with King last month. 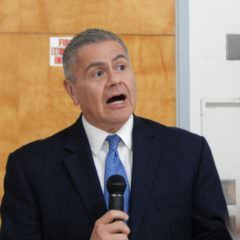 Local District Central Superintendent Roberto Martinez. But Sullivan said all the legal wrangling has to end before Partnership will get involved with the school. “Partnership will not enter into an agreement if litigation is still active, and unless all parties agree,” Sullivan said. The parents are supported by Parent Revolution, a nonprofit group that helps parents organize and take over a failing campus through the state’s Parent Empowerment Act, and is funded by groups that support independent charter schools. The parents are represented at no charge by the law firm Kirkland & Ellis, and Mark Holscher, a partner at the firm, said litigation is usually costly on all sides. He said the Anaheim School District put aside $1 million in a parent trigger battle over a school in that district which the school ultimately lost, and it’s similar to the 20th Street case. 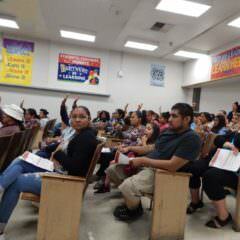 About 200 parents attended the meeting Monday. Most of the three dozen teachers and staff, all wearing yellow school spirit shirts, came to the meeting and protested the Partnership plan. Principal Mario Garcielita, who is just finishing his first year at the school, was brought in during the parent trigger to initiate changes. By November, the parents said they had no confidence in the changes being made and re-filed the trigger option in January. 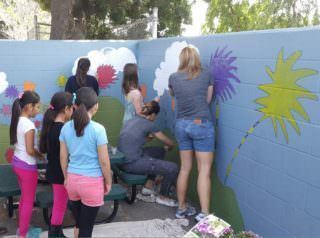 In the meantime, Garcielita announced a grant from a group called People for Parks to keep the school’s playground open on Saturdays, and that the school’s library would be getting a facelift and new books. For most of Monday’s meeting, the principal just rushed around the room holding a microphone allowing the parents and teachers to speak. Lupe Aragon, one of the parents who initiated the trigger, said she has seen some improvements at the school and in some of the homework her daughter is bringing home. The school has also improved by painting murals on the walls, planting trees and gardens and fixing up the library, “but many of these things are cosmetic, and it’s more important to have better education,” Aragon said. Some improvements have been made at the school. The Partnership runs 17 schools in South Central LA, Boyle Heights and Watts and typically take the lowest-performing schools in an area. Sullivan said the Partnership will provide support and professional development for the teachers, employ the principal for the entire year including over the summer and connect the school with other resources to help with technology and teaching programs that are different from those offered through the district. “We also provide extensive workshops for parents that will help you understand how to figure out your child’s reading level” and provide other information including how to apply for scholarships to college, Sullivan said. At Partnership schools, teachers continue to have the same UTLA contract and district seniority, but the curriculum allows for more flexibility. The Partnership piloted the idea of the school report card that every school now has, which assesses what students, parents and teachers feel about the school. Two years ago only 17 percent of the parents and 2 percent of the staff at 20th Street even filled out the survey to rate the school, and last year 65 percent of the parents and 45 percent of the staff participated. Although the recent survey shows significant improvements, scores still rank below the district average. Martinez noted that the school’s reclassification rate for English learners nearly doubled this year, from 23 students to 44, which is a “vast improvement,” he said. Martinez also pointed out that the district already is improving the Parent Center at the school with a $69,000 grant.